It’s been a few months since IISG-sponsored graduate students Sara Paver and Katherine Touzinsky began their Knauss fellowships. We were curious to hear about their experiences so far and thought you might be too. First up is Sara, an alum of the University of Illinois at Urbana-Champaign who is spending the year at the National Science Foundation Division of Ocean Sciences. “I have officially reached the halfway point in my fellowship. I am having a wonderful experience, and the time has passed unbelievably quickly. I would consider the best aspects of being a Knauss Fellow to be (in no particular order) the abundance and breadth of opportunities—no two fellowship experiences are the same, and there is quite a bit of flexibility to tailor your experiences to your interests—and the awesome people you have the opportunity to interact with along the way. I really enjoy working with my colleagues at the National Science Foundation (NSF) and spending time with the other fellows. My fellowship placement is in the Division of Ocean Sciences, where I have been working to facilitate the review of grant proposals submitted to the Coastal Science, Engineering, and Education for Sustainability (Coastal SEES) program and the Biological Oceanography core program. I submitted a few grants to NSF as a graduate student, and it has been very illuminating to see the grant review process from the other side. I especially enjoy meeting and interacting with the scientists who serve on panels. My position at NSF has also enabled me to improve my science communication skills. I revised the 2014 Coastal SEES award abstracts to make them accessible to a non-specialist audience. I have also been writing NSF Highlights to describe the broader impacts of research accomplishments funded by the NSF Biological Oceanography program. Outside of my work at NSF, I have been using my non-stipend fellowship funds to travel. I recently returned from Waterville Valley, NH, where I attended my first Gordon Research Conference. The theme of the conference was “Ocean Global Change Biology: Interactive Effects of Multiple Global Change Variables.” In May, I had the opportunity to travel to the Bigelow Laboratory for Ocean Sciences in East Boothbay, ME to participate in an Ocean Carbon and Biogeochemistry scoping workshop focused on improving predictive biogeochemical models through single cell-based analyses of marine plankton. These experiences provided me with opportunities to network with researchers—including scientists whose work I cited in my dissertation and had specifically hoped to meet—as well as the chance to watch collaborations form and new research areas emerge. The Knauss Fellowship has also provided me with unique extra-curricular experiences. For example, I recently viewed Saturn through a telescope at the Naval Observatory during a special tour for Knauss Fellows set up by Justine Kimball, the fellow currently serving as policy liaison to the Oceanographer of the Navy. Earlier in the year, I went bowling with my NSF colleagues at the Truman Bowling Alley in the basement of the Eisenhower Executive Office Building, which is near the White House. I also went on a road trip with some of the other Knauss Fellows, including IISG fellow Katherine Touzinsky, to Horn Point Laboratory on the Eastern Shore of Maryland, where we completed an Integration and ApplicationNetwork (IAN) science communication course. Be sure to check back here next week to hear how things are going for Katherine Touzinsky. 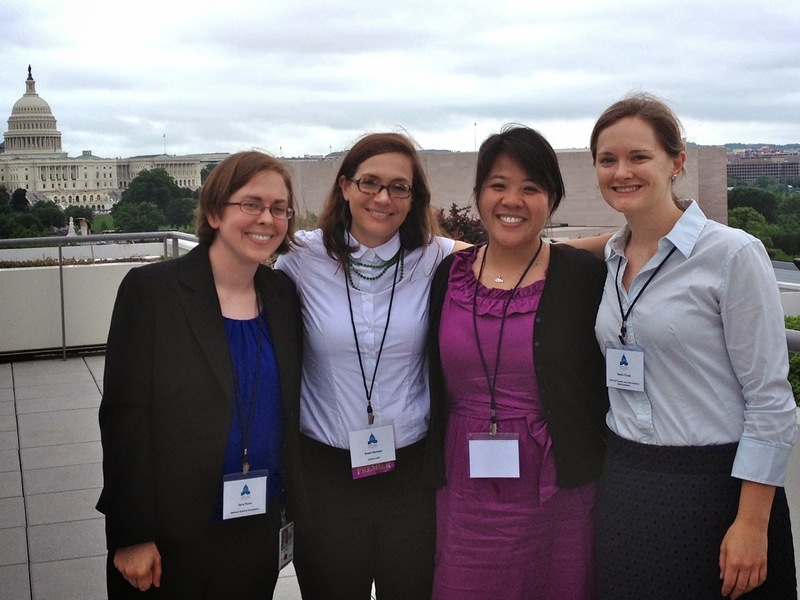 **Photo A: Sara (left) and three other Knauss Fellows take a break from Capital Hill Ocean Week events to pose for a photo. 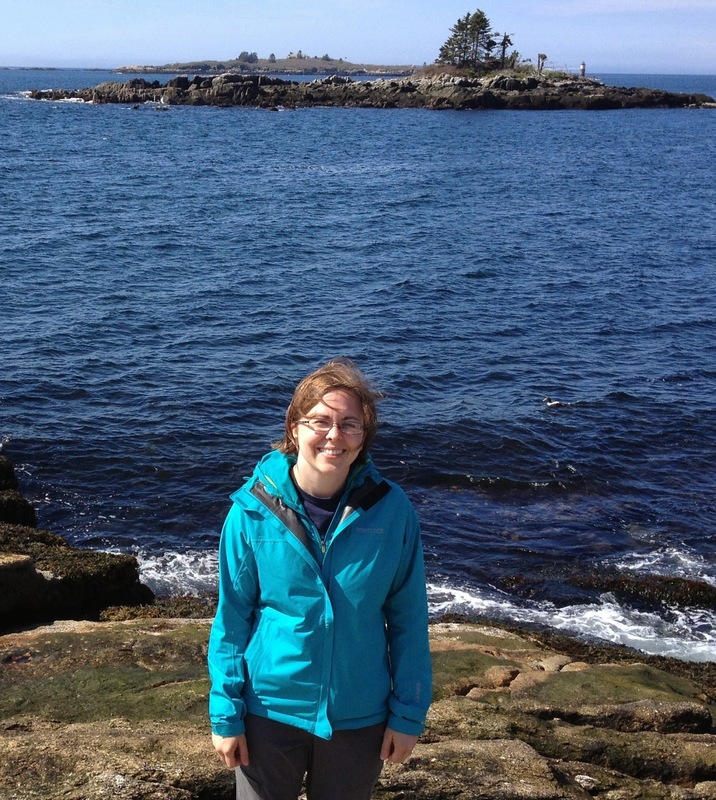 Photo B: Sara enjoying her visit to East Boothbay, ME.